Creeping Cinquefoil is one of several similar wildflower species found in Britain and Ireland. A perennial plant with limp stems reaching a height of just 10 to15cm, Creeping Cinquefoil spreads via long rooting runners. Flowers 12 to 25mm across have five yellow notched petals surrounding 20 stamens and numerous pistils. The petals are backed by a much smaller five-lobed calyx. Stalked flowers are borne solitarily in leaf axils. Spaced a alternately along the stems and varying from long-stalked to almost stalkless, the palmate leaves are divided into five (occasionally seven) toothed leaflets. Except for the far north of Scotland, Creeping Cinquefoil is fairly common and widespread throughout Britain and Ireland. This wildflower occurs also on mainland Europe, Asia and northern Africa, and it is a naturalised alien introduction in many parts of North America. This low-growing wildflower is often found on cliff tops, on urban wasteland, beside car parks and roadside laybys, and on upland hill slopes where the grass is short and the soil free draining. 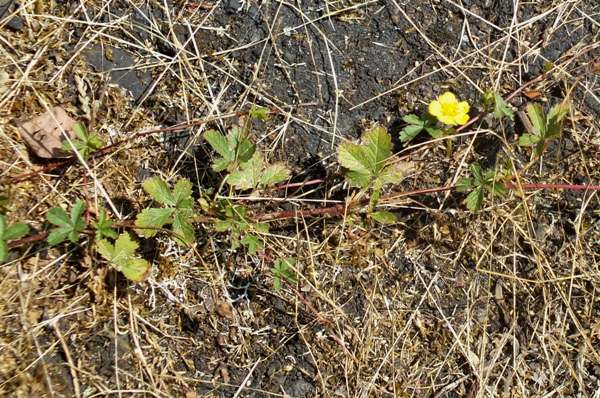 Creeping Cinquefoil spreadsmainly by means of runners that root readily on disturbed ground. In Britain and Ireland Creeping Cinquefoil blooms from June through to August. Potentilla, the genus name, means 'powerful, despite its small size' and is a reference to the claimed medicinal value of plants in this genus. The specific epithet reptans means creeping or crawling (in this instance, at least, not necessarily at the speed of a reptile!). 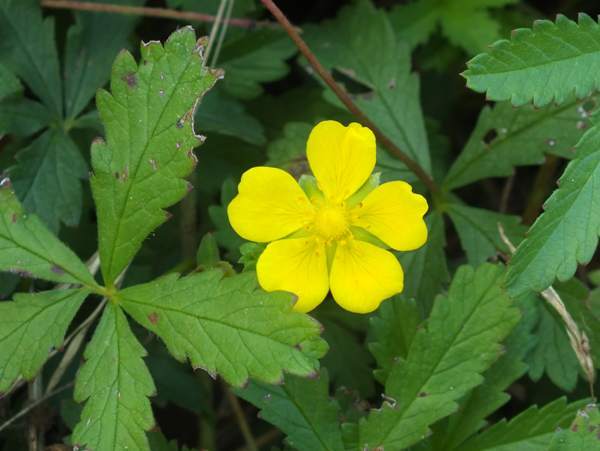 Tormentil, often found on cliff tops as well as in hedgerows, is similar but has four petals, while the five-petalled flowers of Silverweed might possibly cause confusion with Creeping Cinquefoil. Silverweed is easily distinguished by its leaves, which have many more pairsof leaflets and are silvery, at least on the underside and often on top as well. The Creeping Cinquefoil plants shown on this page were photographed in West Wales during June.